The water resistant inkjet coating along with a high quality base paper produces a strong, smooth printing surface ideally suited for many types of high volume CAD and graphics applications. This truly superior coating is optimized for HP, Epson, Encad and similar printers using dye and pigment inks. We are grateful to have found such a good provider and quality product. We have used them all last year and will continue. 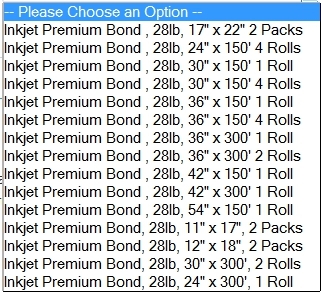 Click the button below to add the Premium Inkjet Paper Roll / Inkjet Color Bond 28lbs to your wish list.